My Raspberry Pi on the kitchen table. The computer is in the small clear plastic box on the right of the picture. I am writing this post on a computer that I built from parts that cost less than £100. I haven’t tried to take a computer apart or put one together since I gave up research about 10 years ago but my eight-year old grandson, recently expressed a desire to do some coding. I decided that I should build him a machine of his own to avoid the risk of him damaging the machine on which I make my living. I still remember one of my early coding mistakes. It destroyed months of work by several of the researchers who used the computer on which I was learning. The computer I built is a Raspberry Pi, product of a project that started at Cambridge University, to develop a computer that would be easy to program and modify. The aim was to get a hundred or so computers to use at university open-days so that students could get some pre-university experience of programming. By the time the first units were shipped in 2012 it was clear that the producers had underestimated demand. By 2016 over 10 million Raspberry Pis had been sold. I bought two, one for my grandson and one for me. The cheapest Pi, the Pi zero, costs less than £5 for the main board. Ours are top of the range model 3Bs, which cost £28 each. They have a 64 bit processor, a gigabyte of memory, WiFi, 4 USB ports and a HDMI display port. The main file-store is a 64Gb micro-SD card. I salvaged two cards from disused mobile devices. I bought a couple of cheap colour displays but we could have used a digital or analog tv. 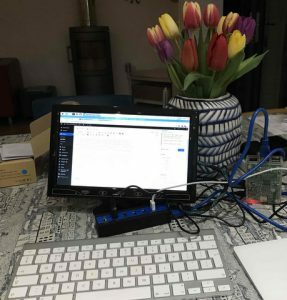 I bought my grandson a combined keyboard and touch-pad for £17:50 and I am using a disused bluetooth keyboard and a USB touch pad. The Pi can use a phone-charger as a power source but I have bought a powered USB hub to make switching it off a bit easier. The performance of the Pi compares favourably with the desktop computers I used during most of my career, although it is no match for my £2000 iMac. The operating system is Linux, which shares many features with the Apple Mac’s unix-based operating system. The memory and file storage are vastly greater than I had early in my career. The computer on which I wrote my PhD thesis had less than a tenth the amount of memory (28K) and less than a thousandth as much filestore (256K). It was also the size of a wardrobe and it cost nearly twice as much as the first house I bought. If you compare prices then and now, the Pi system I built is an amazing bargain. For the current price of my old house you could buy more than five thousand of them. This entry was posted in Academic Life and Afterlife and tagged Writing on February 14, 2018 by andrew.